Before– This patient suffers from severe erosion of his teeth. 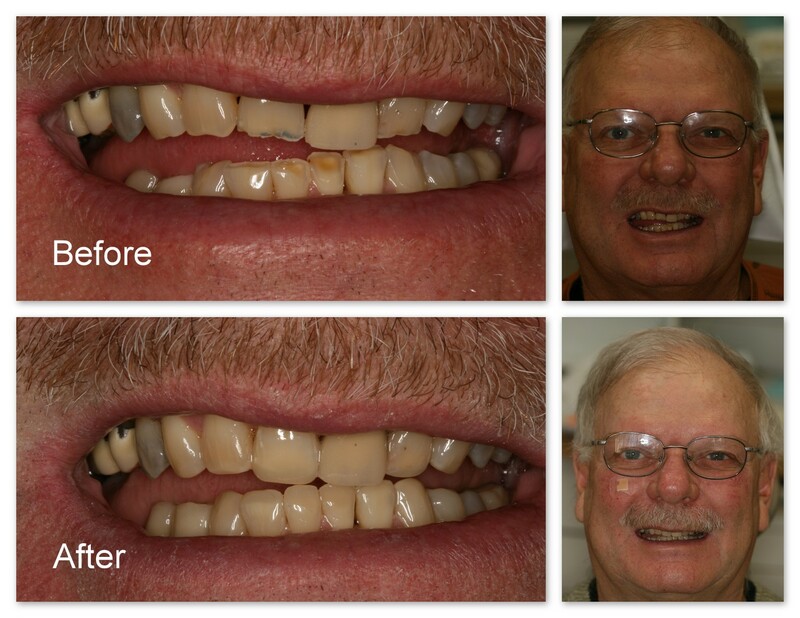 After– Dr. Jack Hosner of Portage, MI bonded composite resin tooth colored restorations to restore and protect all of his worn teeth which greatly improved his overall esthetics. and cost less than half of porcelain crowns. Before– This patient had extremely worn teeth. After– Dr. Jack Hosner of Portage, MI bonded composite resin to restore and protect these teeth which improved overall esthetics. Before– This patient has severe wear on his teeth. He wanted them restored but could not afford porcelain crowns. After– Dr. Jack Hosner of Portage, MI bonded composite resin tooth-like material directly onto his teeth in one appointment without anesthetic to build up and replace the lost or worn tooth structure. Porcelain crowns can be done later as finances allow. Before– A close-up of the worn lower teeth. 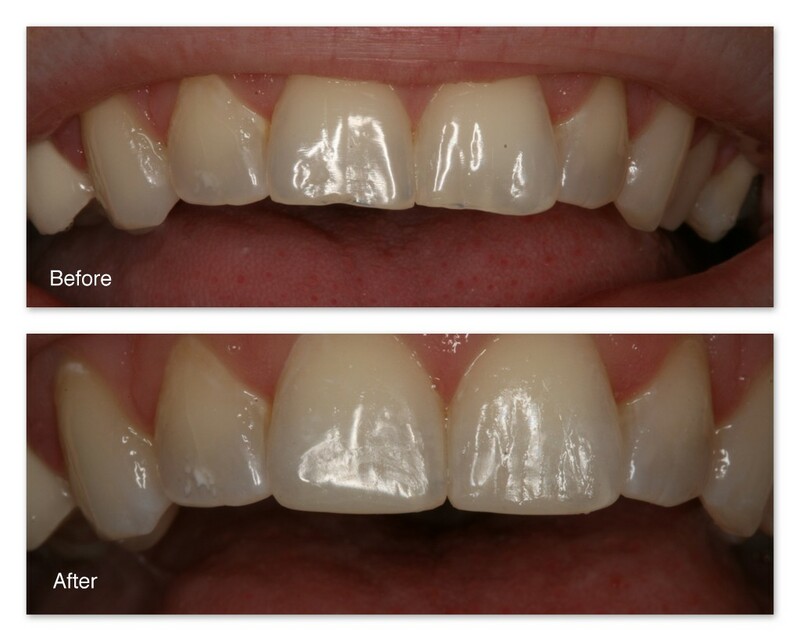 After– These teeth have been restored by Dr. Jack Hosner of Portage, MI. 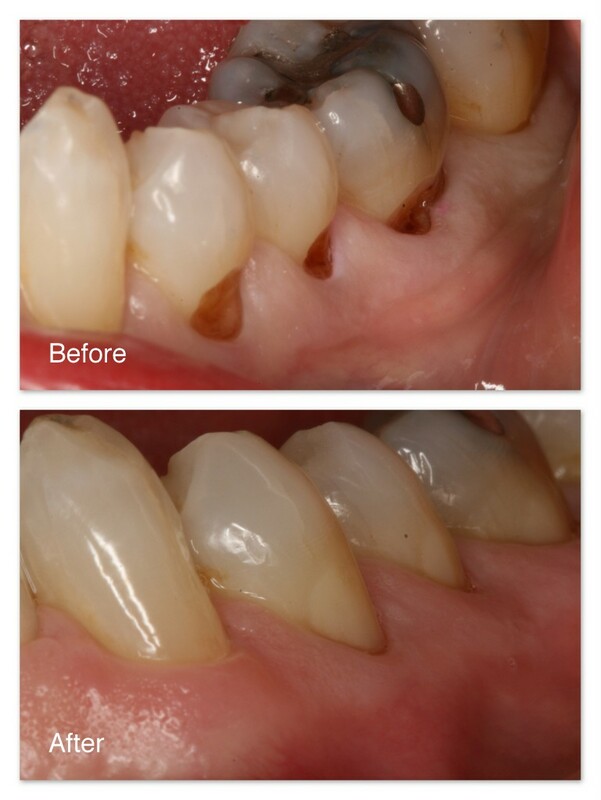 Before– Wear and erosion has taken it’s toll on these teeth. 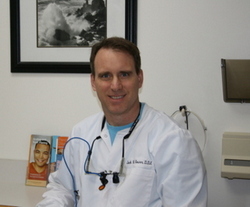 After– Dr. Jack Hosner, D.D.S. of Portage, MI bonded light colored composite resin material to restore the damaged teeth, and as a result, improve their appearance. The restoration of these teeth was done all in one office visit. After– Immediately after restoration by Jack Hosner of Portage, MI. Before– Moderate to severe wear at the necks of these teeth. Before– Side view of the same case as above showing the wear. 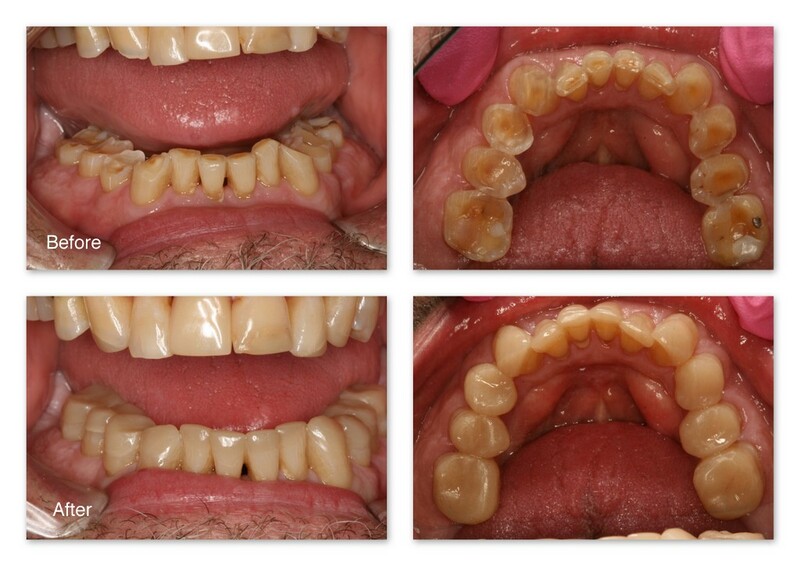 Before– This patient has chipped and irregularly shaped front four teeth. 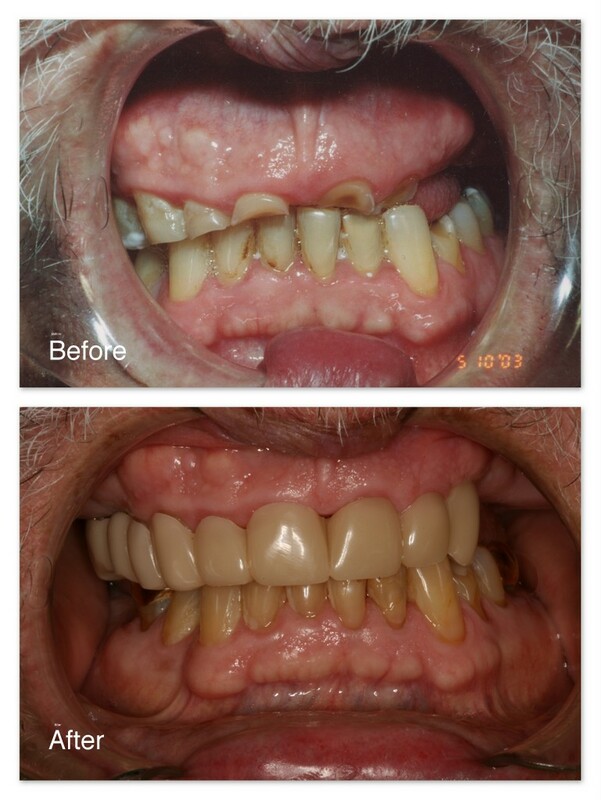 After– Dr. Jack Hosner of Portage, MI bonded composite resin to these teeth and also reshaped them. 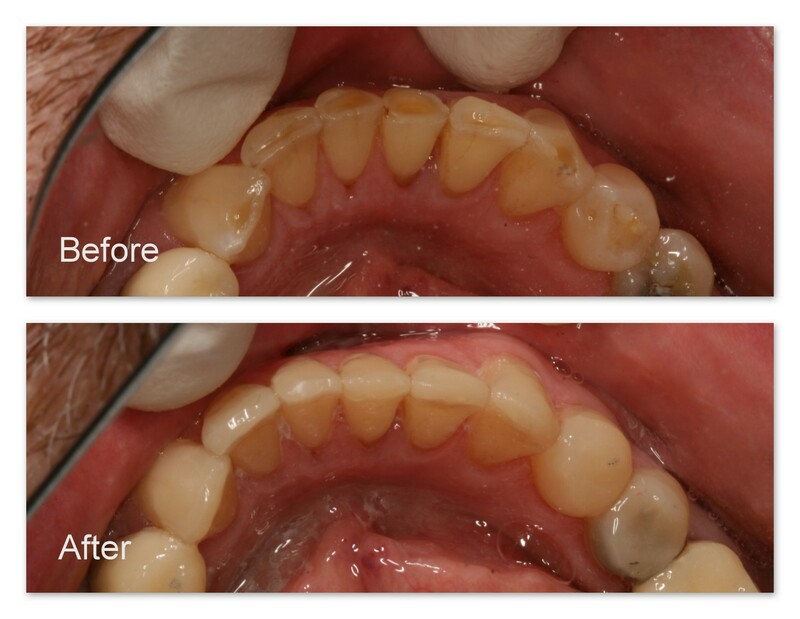 Before– This patient didn’t like the worn surfaces of her upper front two teeth. 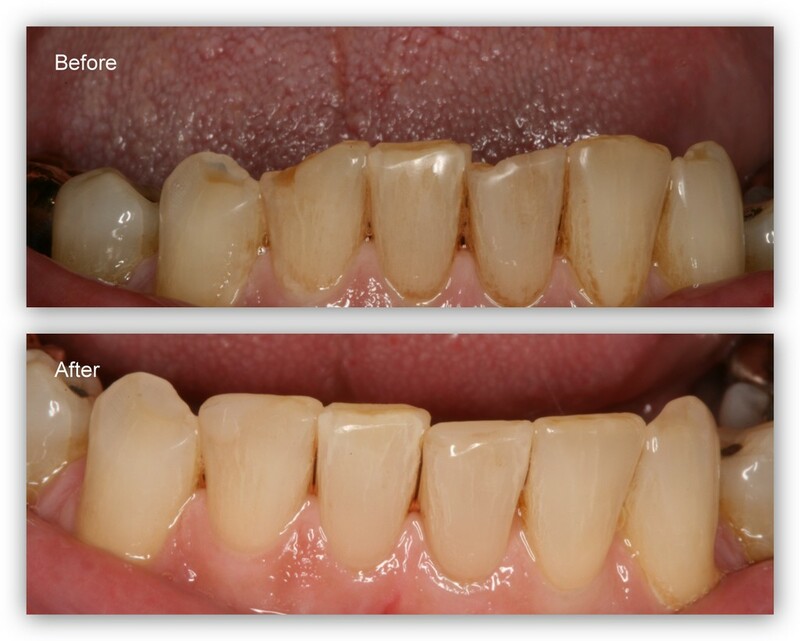 After– Dr. Jack Hosner of Portage, MI bonded restorative material to the worn surfaces to reestablish proper form and esthetics. Before– This patient has worn/eroded teeth. 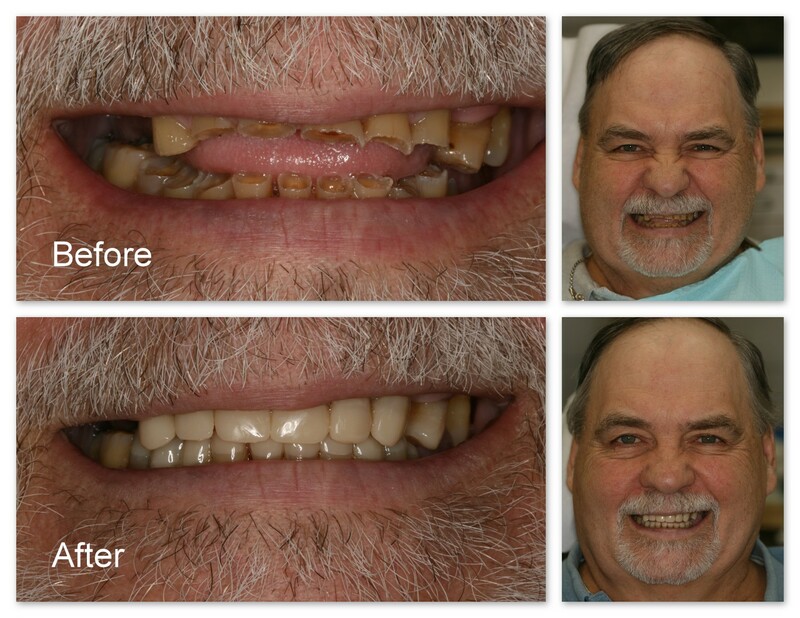 After– Dr. Jack Hosner of Portage, MI bonded these teeth with composite resin thus protecting them from further wear and erosion. This greatly improved the appearance of the teeth as well. 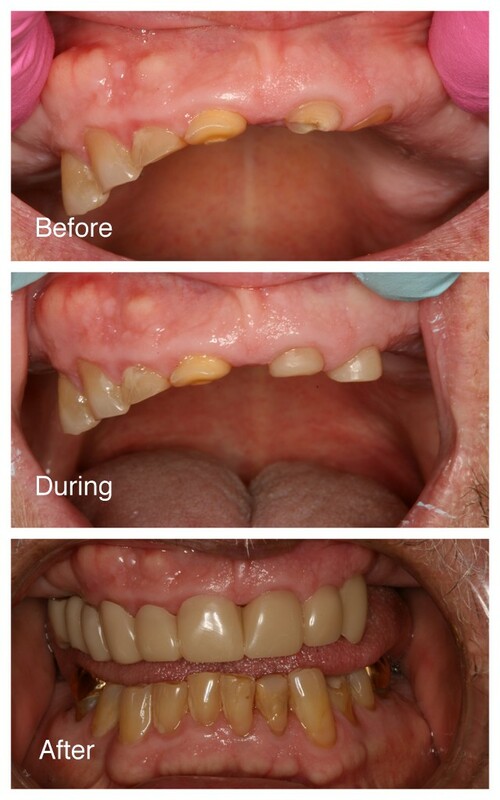 Before– This patient has moderate to severe wear/erosion on his lower front teeth. After– Dr. Jack Hosner of Portage, MI bonded composite resin to these teeth to restore, shape, and protect from further wear. 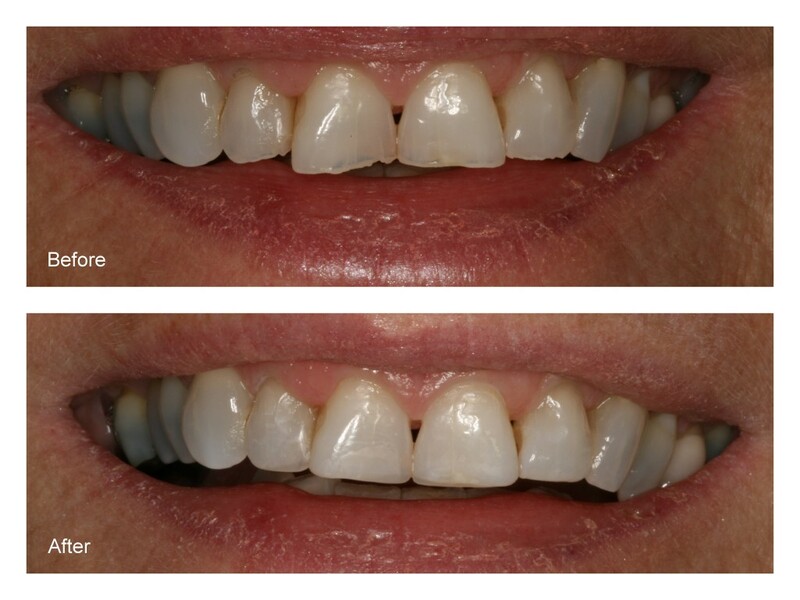 After– Dr. Jack Hosner bonded composite to the four front teeth to restore appearance and protect from fracture. Before– This patient presented to Dr. Jack Hosner of Portage, Michigan with severely worn teeth due to acid erosion from a habit of sucking on lemons. Finances were limited. 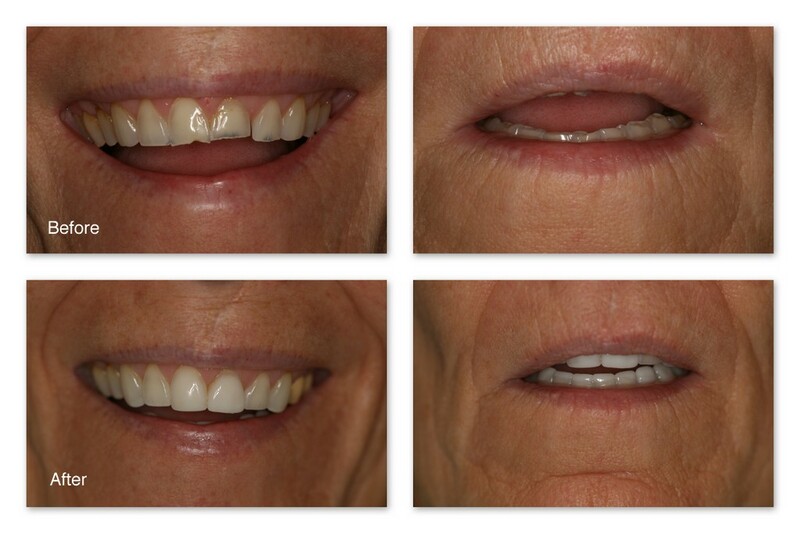 He could not wear a traditional removable partial denture due to excessive bone growth on the sides of his mouth nor could he afford to restore his teeth to normal or to have dental implants. 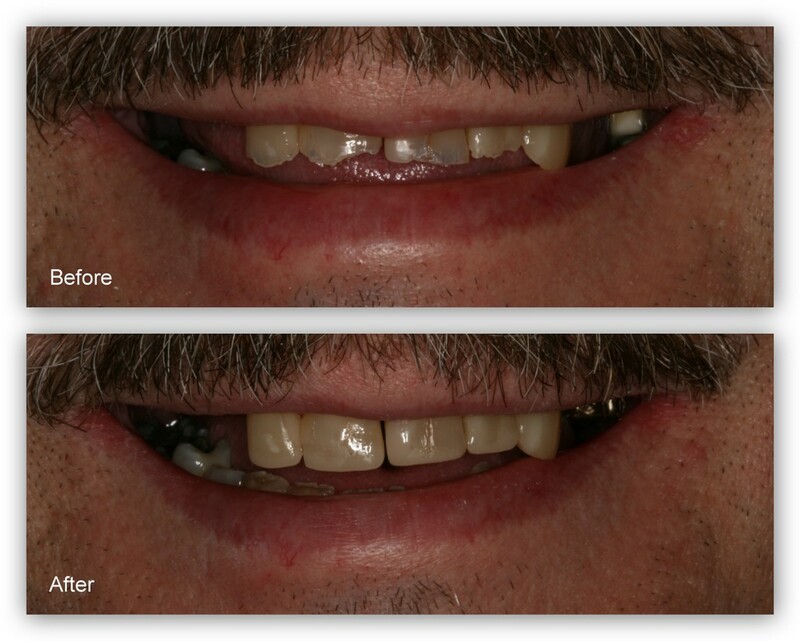 During– Dr. Hosner built up two of his teeth on the right side to help retain a removable “Snap-on Smile”. After– This picture shows the “Snap-on Smile” in place. It grabs onto the existing teeth and is inserted and removed by the patient. Here is a picture of the “Snap-on Smile” out of the mouth. Before– This patient’s front teeth were worn on the front surfaces. 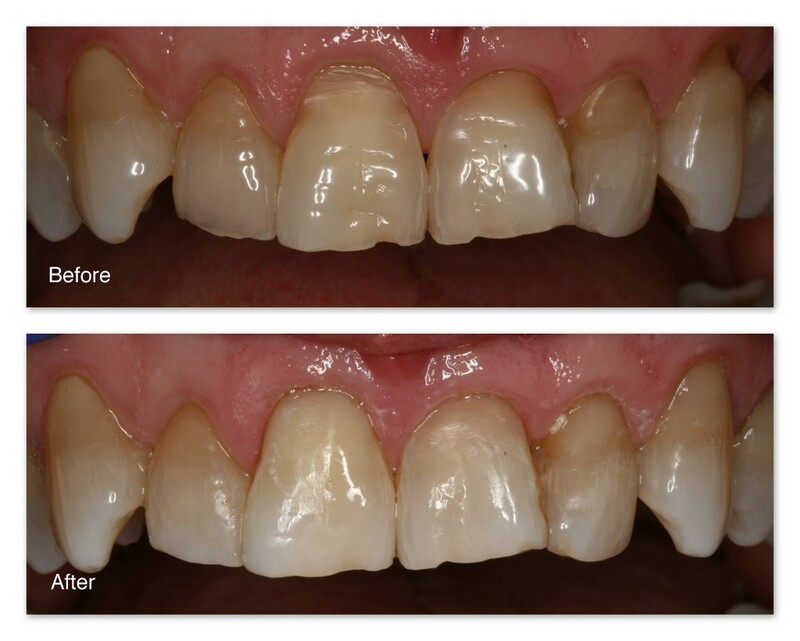 After– Dr. Jack Hosner of Portage, MI bonded tooth colored restorative material to these defects to protect the teeth and reestablish normal contours. Before– Moderate wear/erosion on these teeth. 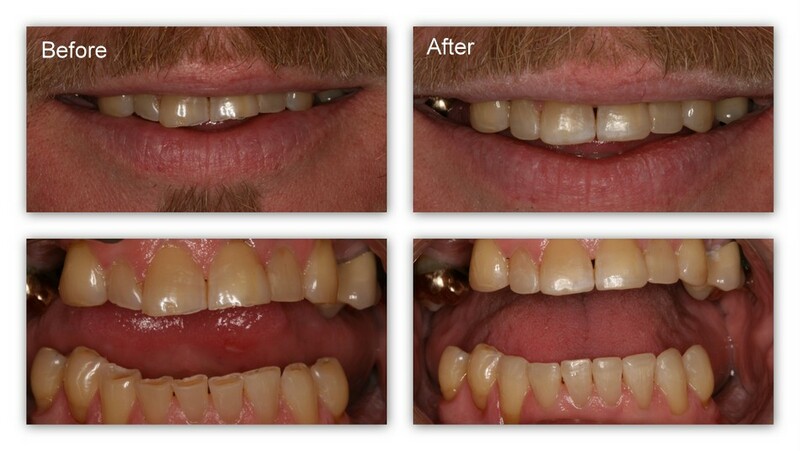 Before– This patient has severe wear and erosion of his lower front teeth. 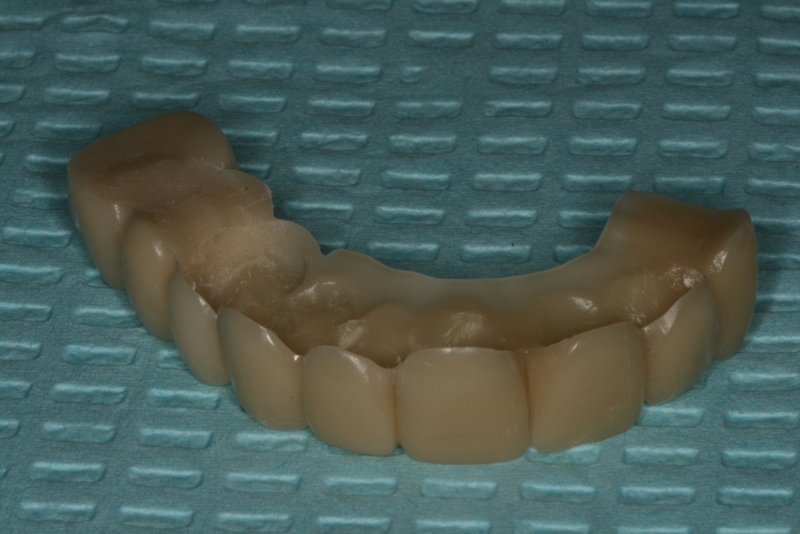 After– Dr. Jack Hosner of Portage, MI bonded porcelain crowns onto the four front teeth and porcelain fused to metal crowns were placed on the other two teeth. Before– This patient has moderate tooth wear/erosion on three teeth at the gum line. 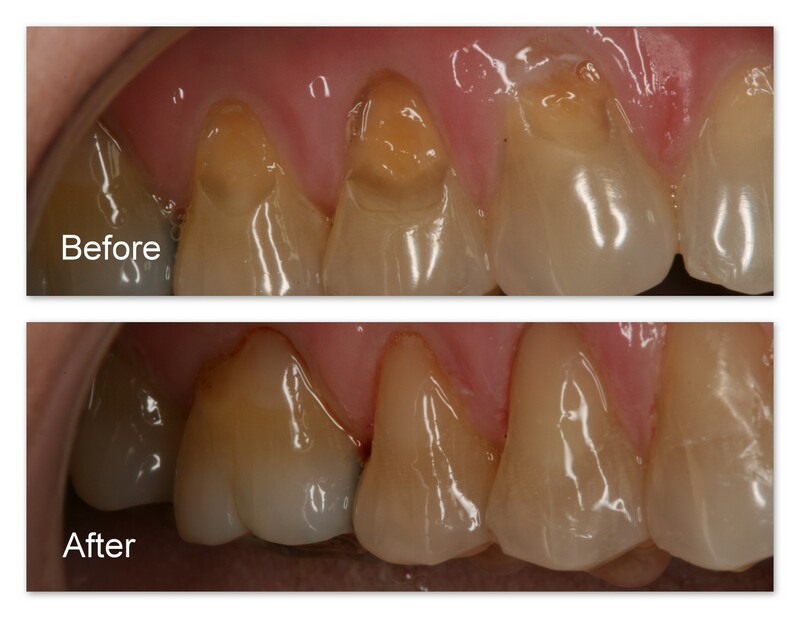 After– Tooth colored fillings were bonded to these defects by Dr. Jack Hosner of Portage, MI to restore lost tooth structure and protect from further destruction.